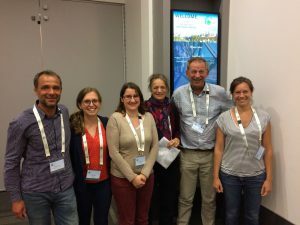 The EuroMix project organised a Continuing Education Course about the EuroMix research emphasis and the EuroMix toolbox at the EUROTOX meeting in Brussels on the 2nd of September 2018. EUROTOX is the largest scientific meeting for toxicologists in Europe and this year almost 1500 people attended representing more than 60 countries. This meeting attracts scientists as well as people working in regulatory agencies and industry. The course was one of six courses that were offered and in total 51 people attended the EuroMix course. The course was held between 10:30 -16:00, so there was enough time to present some of the work in more detail and to offer hands-on demonstration of Monte Carlo Risk Assessment (MCRA 8.2). 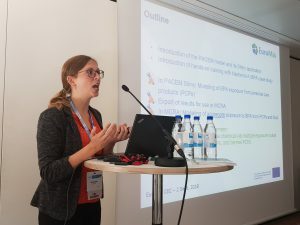 Roland Solecki, Jacob van Klaveren, Marc Kennedy, Cecile Karrer and Hubert Dirven from the EuroMix project presented the project as well as Heli Hollnagel who works as toxicologist for the Dow Chemical company. Presentations were well received and there was good interaction with participants through questions and discussions. Many people were interested in receiving additional training in MCRA. These courses will be offered in 2019. 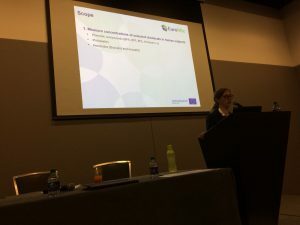 EuroMix activities were presented at the joint meeting of the International Society of Exposure Science (ISES) and the International Society of Environmental Epidemiology (ISEE), which took place from August 27 – 30 in Ottawa, Canada. The EuroMix related session was titled «Aggregate Exposure and Cumulative Risk Assessments in the EuroMix project». 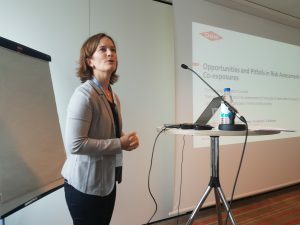 It was chaired by Natalie von Goetz (ETH Zurich and Swiss Federal Office of Public Health, Switzerland) and Cecile Karrer (ETH Zurich, Switzerland). 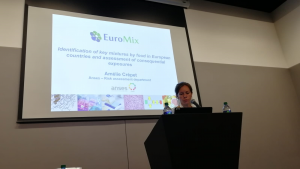 «Identification of Key Mixtures in European Countries and Assessment of Consequential Exposures», presented by Amélie Crépet, French Agency for Food, Environmental and Occupational Health & Safety (ANSES), France. «Verification of Aggregated Exposure to Bisphenols from Diet and Cosmetics – The Human Biomonitoring Study from the Eu Project Euromix». This topic should have been presented by Monica Andreassen, Norwegian Institute of Public Health (NIPH), Norway. Due to illness this was changed and the presentation was held by Cecile Karrer. «Taking Account of Variability and uncertainty in Cumulative Risk Assessment», presented by Waldo de Boer, Wageningen University & Research, The Netherlands. About 40 attendants listened to the talks and there were several questions and comments, which showed the broad interest in the topic. The Belgian Society of Toxicology and Ecotoxicology (BelTox) will organize the 54th Congress of the European Societies of Toxicology from 2 to 5 September, 2018, in Brussels. The theme for 2018 is “Toxicology Out of the Box”. More information and registration can be found here. Please find detailed programme here. The 2018 EUROTOX Brussels congress not only offers you an innovative scientific programme, but also Continuing Education Courses (CEC) to help you accelerate your career. One of these CECs (CEC1 – Exposure, hazard and risk assessment of mixtures of pesticides / chemicals in food using the tools developed in the EuroMix project) is organised by EuroMix. The agenda for the course can be found here. Five EU-funded H2020 and FP7 research projects i.e. EDC-MixRisk, EuroMix, EU-ToxRisk, HBM4EU and SOLUTIONS, are working together to address different aspects of the impacts of chemical mixtures and combined exposure. The projects have engaged into an exchange between the consortia, European Commission Services and relevant EU Agencies in order to identify remaining gaps in mixture research and policy. As a result of this effort, a joint workshop entitled “Advancing the Assessment of Chemical Mixtures and their Risks for Human Health and the Environment” was organised at Joint Research Centre, Ispra, 29-30 May 2018. The workshop brought together around 60 experts working in the field of chemical mixtures. The workshop provided a great forum to discuss the latest advancements in science as well as research and policy needs in order to make progress in mixture risk assessment and management. The topics of the workshop included hazard and exposure assessment, data and tools, and risk analysis and governance. The international horizons and developments outside the EU were covered by keynote speakers from USA, Japan and OECD. Although much progress has been achieved over the recent years, the participants stated that it is evident that more needs to be done to better address the combined exposure of multiple chemicals, both in terms of intentional (e.g. pesticides and cosmetic products) and unintentional mixtures (e.g. contaminants via air). One of the major gaps continues to be the lack and availability of data. The Information Platform for Chemical Monitoring, IPCHEM is addressing the gap for chemical monitoring data. However, another big challenge remains in the accessibility and quality of data on (eco)toxicological properties and on the types of use of chemicals. In the group and plenary discussions, ideas were brought up on improving governance aspects to better protect public health and environment from hazardous chemical mixtures. The proposals from many project participants included e.g. encouraging policymakers to look into the opportunities of establishing clear legal mandates for mixture risk assessment within EU chemicals and environmental legislation and across the regulatory silos. It was also suggested that “protection goals” should be established for human health, applying the idea and concept from the Water Framework Directive which requires good chemical and ecological status for European water bodies. For humans, similar type of “protection goals” could be set for good chemical and health status. Furthermore, it was raised that there is a need for developing uniform principles and harmonised approaches for performing human and environmental mixture risk assessments. In practice, also procedures should be piloted and put in place to enable more holistic and systematic mixture risk assessments, across regulatory bodies and sectors. It was concluded that interdisciplinary and international collaboration as well as dialogue between scientists, regulators and policy-makers are essential to make progress in the mixture efforts. The workshop outcome and future research needs will be published later in 2018. JRC has published recently a news item on chemical mixtures and safety of combined exposures here. JRC has also published a related Policy Brief: “Something from nothing? Ensuring the safety of chemical mixtures”. The first European Exposure Science Strategy Workshop, will be held 19-20 June 2018 in Dortmund, Germany. This workshop is organised by ISES-Europe and will provide an unique opportunity to shape the strategy for exposure science in Europe. For details about the program on advancing exposure science in Europe see here. To express concern and raise awareness on hazardous chemical mixtures and combined exposure, the Coordinators and representatives of several EC funded research projects, EDC-MixRisk, EuroMix, EU-ToxRisk, HBM4EU, SOLUTIONS, have sent a position paper (17 April 2018) to Director‐Generals of DG Environment, DG Research and Innovation and DG Health and Food Safety. The position paper entitled “Preventing risks for people and environment from hazardous chemical mixtures” calls for action, taking benefit from the step-wise translation of the science i.e., employment of already existing as well as development of new approaches, methodologies and tools. It proposes 12 key actions and recommendations to help better address combined effects and overcome remaining gaps in chemical mixture research and policy making. It also provides some feedback and ideas from research projects’ perspective to the preparations of the next Framework Programme, Horizon Europe. Researchers and stakeholders agreeing with the key messages have the opportunity to support the initiative and co-sign the position paper (until 31 May 2018). Link to the co-signing form. Five EC funded H2020 and FP7 research projects i.e. 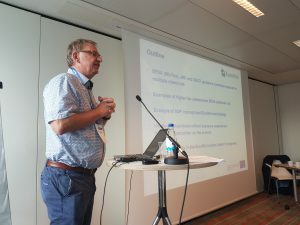 EDC-MixRisk, EuroMix, EU-ToxRisk, HBM4EU and SOLUTIONS, are working together to address different aspects of the impacts of mixtures on human health and the environment, including also research activities at the European Food Safety Authority (EFSA) and the Joint Research Centre (JRC). Through this collaboration, synergies, knowledge exchange and the ability to exchange and use methods and data will be promoted. A joint workshop ‘Advancing the Assessment of Chemical Mixtures and their Risks for Human Health and the Environment’ will be held 29-30 May 2018 at the Joint Research Centre in Ispra, Italy. The aim is to discuss the current state of knowledge as well as further elaborate and prioritise areas for future policy and research needs. The active participation of experts from EFSA, JRC, the European Environment Agency and Directorate General Environment, as well as Directorate General for Research and Innovation will ensure policy relevance of the discussions. The topics of the workshop include hazard and exposure assessment, data and tools, and risk analysis and governance. The meeting will focus on setting the scene in terms of governance and policy frameworks as well as on advancement in research, knowledge and identification of gaps. Further research and policy needs in the field will be discussed and elaborated together with the workshop participants. Also, there will be an opportunity to learn about the international approaches from U.S., Japan and OECD work. The intention is to publish the outcome of this workshop in a scientific journal. The ultimate aim of the collaboration is to maximise the impact of the work on mixtures and to enhance chemical safety. EuroMix is testing the effects of mixtures of chemicals in several different assays using cell lines, zebrafish and animal models. The results of the testing is analysed using the Benchmark dose method to calculate the relative potency and dose-additivity of the different chemicals. 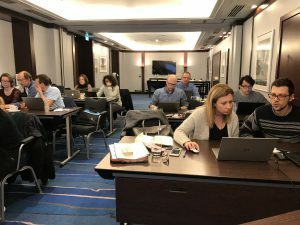 On March 22, 2018 EuroMix participants were trained in using the PROAST web application for Benchmark dose analysis. The training was organized by Wout Slob, RIVM and Johanna Zilliacus, Karolinska Institutet. The human biomonitoring study in EuroMix was presented as an abstract and a poster at the 57th annual meeting of Society of Toxicology (SOT) in San Antonio Texas last week. The abstract was awarded as “Top 10 mixtures abstract” in the Mixtures Speciality Section. 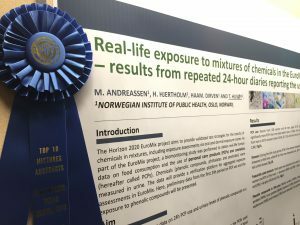 The preliminary results presented as a poster on SOT, illustrates that the reported 24h use of personal care products (PCPs) by 144 adult volunteers in Norway were correlated with urinary levels of several phenolic compounds in 24h urine samples. Pairwise correlations were found between the use of all PCPs, body lotion, anti-wrinkle cream and hand cream and urinary levels of oxybenzone (OXBE). Furthermore there was a pairwise correlation between the use of foundation and urinary levels of bisphenol F (BPF), the use of lip-gloss and urinary ethyl paraben (ETPA) and the use of hand cream and urinary propyl paraben (PRPA). Hubert Dirven and Trine Husøy attended the SOT conference and experienced a lot of interest in the EuroMix project. Monica Andreassen prepared the abstract and the poster.